I am ALWAYS on the hunt for easy weeknight meals that take under an hour to make (and that’s total time). With that being said, I’ve recently started using Pinterest a lot more when it comes to meal planning and finding/saving new ideas. It’s my favorite tool right now. 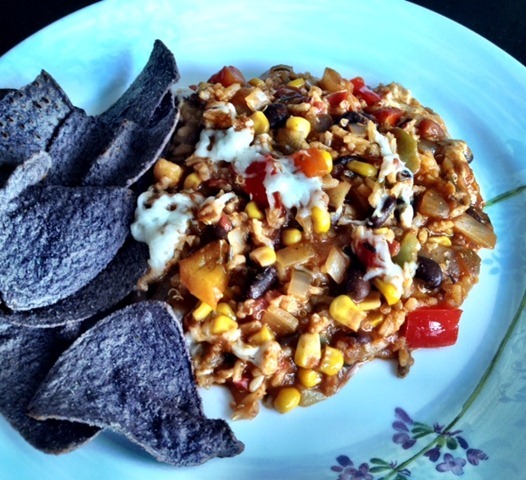 I pinned a Black Bean and Quinoa Enchilada Bake recipe by Two Peas and Their Pod over the weekend, added it to this week’s meal plan, and made it yesterday. It turned out so well that I had to share the outcome. Besides fitting my “under an hour” expectation, it was delicious, filling, and customizable. And we now have leftovers for days <—the best! I particularly love these kinds of recipes because they serve as more of a framework than precise steps. So while I followed the recipe fairly closely, I was able to change some things as I went along and make it my own. I used a quinoa rice mix we got at Costco instead of just quinoa. I also increased the amount of veggies in the dish – one large onion vs. a small one, 3 bell peppers (green, yellow, and red) vs. just two, one entire can of corn vs. a cup. With the spices, I doubled the amount of cumin and added a little extra chili powder. Since we didn’t have fresh cilantro, I used a cilantro paste instead (the kind that comes in a tube). A couple of good squeezes was all I needed. Vishnu isn’t the biggest fan of black beans, so I used one can instead of two. I bought Trader Joe’s red enchilada sauce over the weekend (very good!). Since the recipe calls for two cups of sauce, I added the 12 ounce bottle plus a can of diced roasted tomatoes. Goat Gouda is my new favorite cheese, so I used that instead of shredded Mexican cheese. Unless a recipe involves multiple new-to-me ingredients and/or a completely new cooking method, I don’t follow it to a tee. I find that for weekday meals I gravitate towards these kinds of recipes because they allow me creative freedom while providing some structure. This makes everything easy – from planning to shopping to executing. What’s your favorite go to weeknight meal? Goat gouda?! Where do I find that?! I love goat cheese and I love gouda… I had no idea that that gouda could come from goat milk… (Is that stupid? Should I have known that? Maybe.) I’m now on the lookout! This looks delicious! Trader Joe’s or Whole Foods! It’s in the cheese case! You’ll love it! Oh MAN. This sounds and looks so good! The only enchilada bake or casserole I’ve ever made was based on Peas and Crayons version. Love Jenn and her blog, but I do love Two Peas and their Pod! I need to get my hands on some of this goat gouda! I wonder how it would taste with some tempeh in it for some added boost of protein..?? Tempeh would be a great addition. Next time I make this, I’m going to add another protein. YUM! I love coming home to leftovers! 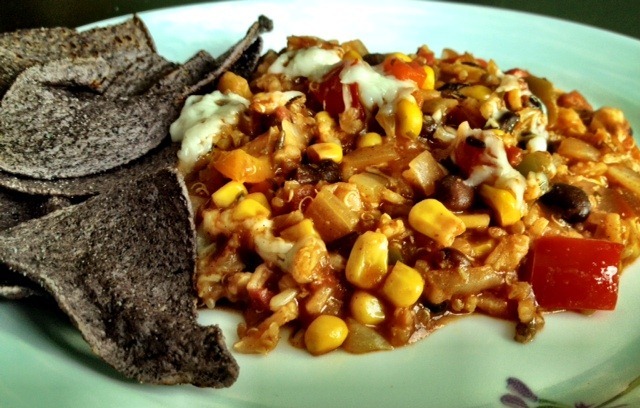 Thanks for sharing this enchilada bake, Parita! I have several fav go to weeknight meals, but quinoa, qith onions, ginger, garlic and turmeric and whatever veggies are around is a staple! Shashi @ http://runninsrilankan.com recently posted…Split Pea Stew! I have been wanting to cook more Mexican food but I am just unsure how to get the flavour! (without using a Mexican spice sachet or bottle) Yours looks great.